This was a small story early in the year, but garnered few headlines. After all, with the huge Confederate flag at I-4 and I-75, Tampans are probably tired of hearing about the Civil War. But, alas, the Sons of Confederate Veterans are angry again. This time over license plates. 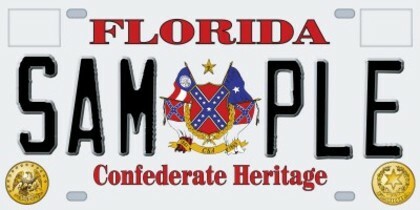 Last year, the SCV petitioned the Florida Legislature to approve a license plate bearing the Confederate flag. They found a sponsor — Panhandle Rep. Donald Brown, who, by the way, looks like a 19th century throwback himself — and the race was on to join other Deep South states with similar license plates. The money would have funded “educational and historical programs” from the SCV. The bill never made it out of committee. So, in January, the SCV sued the state of Florida. But, what can you expect from a group still angry over the Civil War, right? They are being represented by the Rutherford Institute, whose biggest claim to fame was representing Paula Jones in her suit against former President Bill Clinton. Big players, these guys. But lest you think this was some crazy conspiracy on the part of intolerant legislators who HATE Confederate veterans, puppies, the Gandy beach, and all things sacred … the SCV wasn’t the only organization snubbed by lawmakers. Last year, a number of organizations petitioned for their own license plates: Tennis players, Christians, horse lovers. Choctaw Indians wanted free license plates, but they didn’t get their wish either. Considering the U.S. government committed genocide against them, I’d think they’d deserve a few free license plates. But no, and surprise, they aren’t suing over it. Get the full text of the federal lawsuit here. Did you really have to lay me off? How-To Korea: How to send mail from a Korea Post Office to the U.S.
That was a frankly good article. You are precisely right with this blog!! Very illuminating piece of writing! I dont disagree with this article! This definitely makes great sense to anyone!